Sometimes I just marvel at what we can do now in our own homes with paper crafting. I worked with Desiree Tanner at Provo Craft about fourteen years ago. I remember when they first came out with the lacy paper accents (Laser Layouts, if I remember right). It was an expensive process. And now we can do it ourselves? And let’s not forget title making! Who remembers printing a title in reverse on cardstock and using scissors an x-acto knives to cut the out…just for the look of something unique. Ohhh, the ease of it all! I love it! Here’s a little something from our darling Miss Laura using all those things that were so pain-stakingly and expensively done just a few years ago. Makes ya appreciate what we have now, right? I created a layout a few months ago that ended up being one of my favorite layouts in a long time. It wasn’t just the page design that I loved (which included one of Kerri’s Storyboard Templates and a few of her words pieced together for my title), but the photos and the meaning behind the story as well. I decided that since I loved it that much, I would use it as inspiration for this layout. The overall page design has the same look and feel (except the other layout is about football! ), and I even used the exact same Storyboard Template to create my photo collage as I used on my original layout. I keep trying to branch out and use different background cuts for my projects. 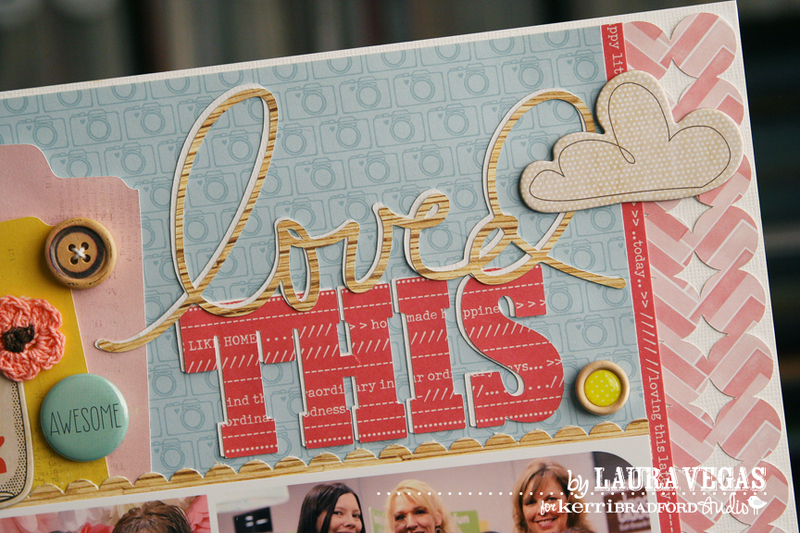 After all, Kerri has so many great backgrounds to choose from in several of her kits. But I always seem to come back to that circle background. It’s a favorite of mine, and I’m pretty sure I use it more than any other background in my collection. I cut two of the tall file folders from the Life Additions #2 kit, and I had every intention of using those to hold my journaling. 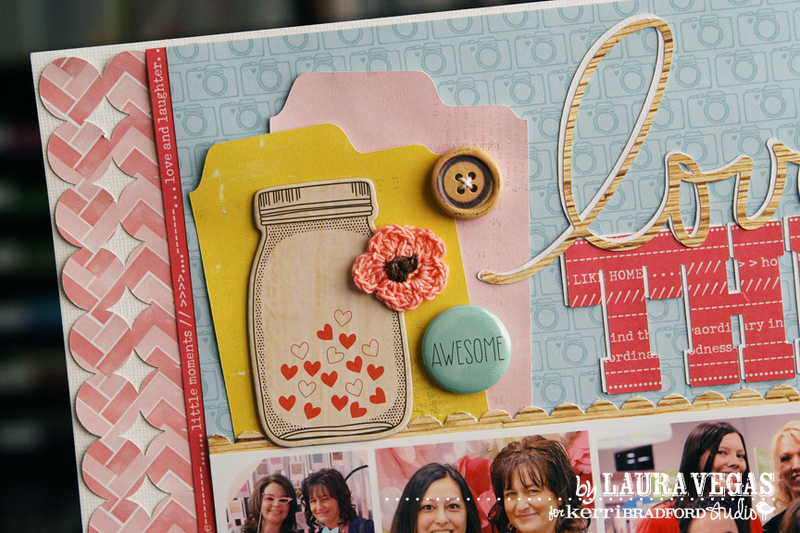 But I came across the chipboard jar piece and it just fit there to nicely, along with a little embellishment cluster. So I simply moved my journaling to the bottom of the page, which is where I had it on my original layout as well. Wonderful! I love the column of elements with the outer edges being background and the colors and textures are just so fabulous! Thanks so much for sharing! 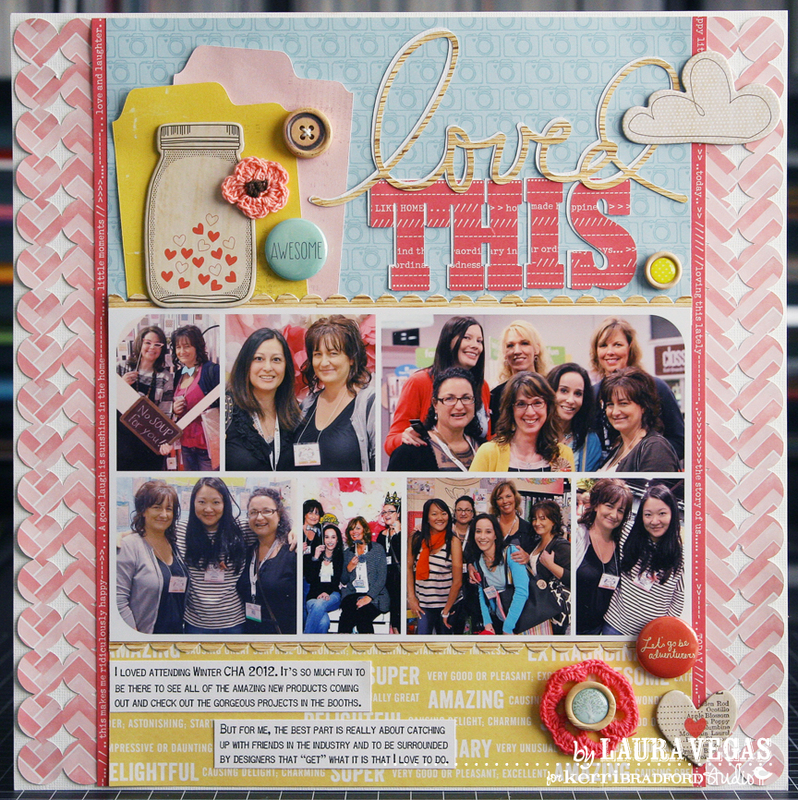 Laura is one of my favorite designers because she always uses tons of photos and keeps her layouts easy to dissect and emulate! Oh I remember the days of the old exacto knife (and it doesn’t seem that long ago), thought I was very clever. Gorgeous layout. Love the title & all the colour.